As children we were often told the moral of the story. Remember those? By adults who wanted to frame circumstances in a different light for us. Over the weekend I read this delightful book. The main character had lost a son years before. She had never really lived her life since his death. Just endured it. She liked to spend time at the Victorian cemetery, making up stories about the dead people. She had no grave site for her son, whose body never washed up on the beach, so she made do with strangers. Then she has a chance encounter with two amazing women. One is Sally Red Shoes. And the other is Kitty Muriel. 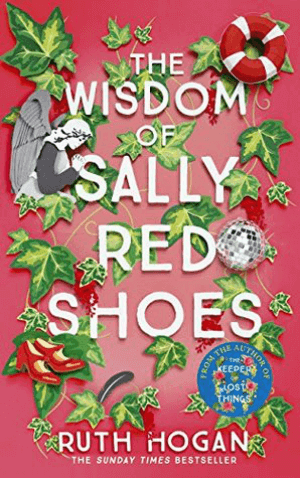 Masha assumes that Sally Red Shoes, odd as a three dollar bill, is a bag lady. Sally also visits the cemetery daily. But she comes to feed the crows. And she always wears her bright red shoes. Without provocation or preamble Sally Red Shoes would open her arms up wide, turn her head up to face the heavens and begin to sing. Fulsomely and quite loudly. Then there was Kitty Muriel. She was a convent girl-turned magician’s-wife-turned-seventy-something-roller-disco-fanatic. She too had lost a child. Strange as the day is long, Kitty Muriel fascinated everyone she met because of her costume-like clothing, gaudy makeup and confident demeanor. When Sally died, Masha went to her funeral and found that Sally was not a bag lady at all and her real name was not even Sally. In fact she had been a renowned opera singer. But then one day Sally got herself up and dressed and made herself useful. She visited old folks homes and volunteered. Brought cheer to all kinds of organizations. Then went to the cemetery to feed the crows. Sally was much more than met the eye. She lost her great love, grieved him fully, then went back to living. 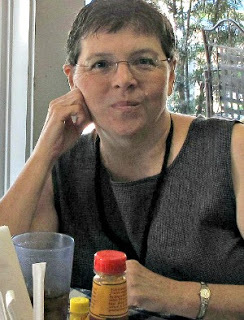 Kitty Muriel lost first her daughter and then her husband to suicide, but she believed that the road down grief’s lane led to living a full and happy life in honor of her child. And Masha was drowning in her sorrow, not really living her life at all. She was putting one foot in front of the other and getting through it. Kitty Muriel wore crazy outfits and did what she darned well pleased and no one judged her. Because she was so confident in her eccentricity. Sally Red Shoes embraced life so fully even the crows she fed were spellbound by her. Masha learned so much from these two odd women, for they took different paths after their loss. And both taught her how to live again. Tomorrow our Frugal Friday Tips topic will be favorite frugal meals. Please also give me suggestions of what you’d like to cover in the future. How sweet! This sounds like a good read. This sounds like a very good book! I love reading your book reviews, you write beautifully. I am off to buy this on Amazon! I will have to look for this book since I have lost a daughter. I’m not quite as stuck as Masha but certainly nowhere near as courageous as Sally and Kitty. It sounds like a very interesting story. I am looking forward to reading about frugal meals. That’s the one I suggested and have been waiting for. Thank you Brenda. I am a starting gardener, know almost nothing and would like to approach gardening herbs and vegetables frugally. Any help/advice would be much appreciated. How about frugal get-away’s. Short ones, maybe an hour or two, or longer, a day trip, a weekend or even a bus ride around town. Sometime I long to roam but money’s tight and mobility is an issue. Thanks for your book revues, too. I recently read “Dog Songs” by the late Mary Oliver – a dog lover’s book for sure. OH MY! This is definitely on my to read list. Thank you so much for sharing this information. I’d love to see some tips on how to decorate my large fenced patio with plants and flowers really, really cheaply. In Florida where plants go to die. This sounds like a great book. Have a great Friday tomorrow and wonderful weekend. Sounds like a good read, Brenda. I am, for the first time, keeping a list of the books I read this year. I have tho’t about doing this for years. Finally, I am doing it! Not that it’s an original idea at all; just that I’ve always been curious about how many books I actually read in a year. I list the book and author then a brief note about how I felt about the story. I’ve been trying to think of another thrifty topic. Let’s see–how about how to obtain art and craft supplies cheaply? I am always looking for supplies to use without breaking the bank as buying paints and other items at the regular stores gets to be costly. Have a lovely weekend, Brenda, Ivy and Charlie. Hope you get some sunshine! How about beauty tips, makeup,hair coloring, nails. Also DIY h ome decor. Thank you so much for the recommendation! I’ve been looking for a new book to read! Looking forward to Frugal Friday! Love and hugs!